The weekend in Rehoboth Beach looked gloomy during Friday's downpour which was accompanied by a strong ocean breeze and powerful waves. Some parts of town experienced minor flooding Friday afternoon. Rehoboth Beach City Manager Greg Ferrese directed public works crews to trouble spots. This is Sussex Street just west of Third Street where a storm drain was overwhelmed. The black bag was removed from the parking machine in the city hall parking lot this week, only to be replaced with a note instructing parkers to pay at the parking meter office. The Reinos continued to keep meter repair techs busy this weekend, but all four multi-space Reinos on Grenoble Place (not shown) were pressed into service for the weekend. THE DREDGES ARE COMING, THE DREDGES ARE COMING! A Rehoboth Beach lifeguard reported Sunday afternoon that one of the beach replenishment workers stated that the company would make changes to its delivery system Sunday and begin pumping sand to shore in Rehoboth Beach on Monday (today). The roar of the engines from the dredges, Dodge Island and Manhattan Island, are getting louder as the ships creep northward. Look for them off Rehoboth Beach this week at: http://henney.com/sp. 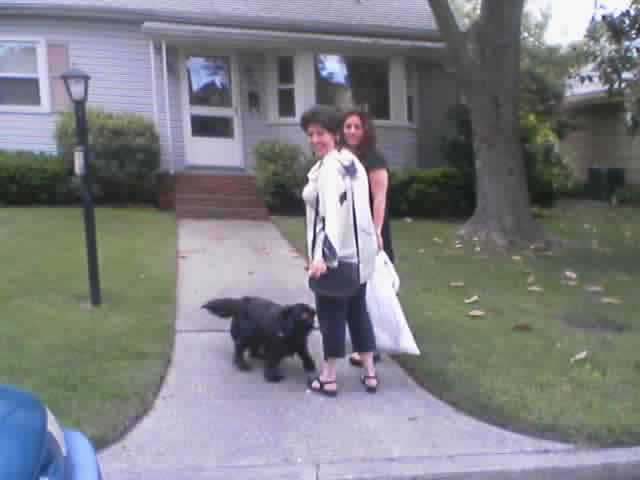 D.C. Councilmember Carol Schwartz in front of her Rehoboth Beach home with her new dog. This photograph was taken Saturday evening using the Nextel i275 camera phone. The artist who designed the base used to support the six-foot dolphins is seen here inspecting several of the sculptures, decorated by local artists and sponsored by area businesses to raise funds for Rehoboth Beach Main Street. The three platforms on the left were from The Mizzen Mast, Redfish Designs and Jakes Seafood Restaurant.